L’azerbaijan est divise en 59 districts (appele rayon) qui portent le nom de la ville principale, 11 villes et une region autonome. 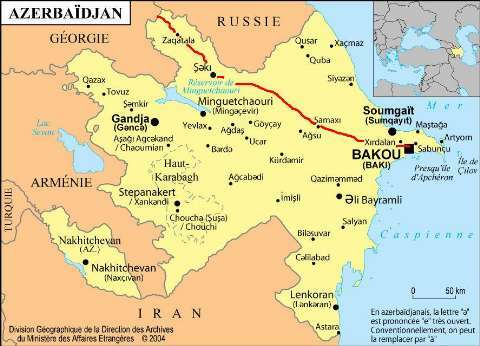 Nous somme donc entrée par le Balakan Rayonu puis avons traverse Zaqatala, Saki (Cheki), Qax (Kar), Qebele, , Ismaeli, Samaxi (Chamari), Qobustan (Gobustan), Absheron puis enfin la region de la capital: Baku. Nous avons donc suivis la chaine de montagne du Caucasse par le sud pour finir par un mini desert afin d’atteindre la mer Caspienne. Azerbaijan is dived in regions ( called Rayonu) which have the name of the most important city. We entered in the Balakan Rayonu and passed trough Zaqatala, Saki , Qax, Qebele, Ismaeli , Samaxi, Qobustan, Absheron and finally the region of the capital city: Baku. So we followed the Caucasian mountain on the south to end it by a small desert to reach the Caspian sea. Bon, pour etre honnete, les retours que nous avons eu sur le pays n’etait pas tres bon. Nous avons tout de meme essayer d’y arriver en faisant abstraction des ces derniers. Avec nos bases de Turc, peut etre que les choses se passeront differement et effectivement nous avons ete plus qu’agreablement surpris. Par les paysages d’une part et aussi par l’accueil des gens qui fut formidable. Ok, to be honest, the feedbach that we had about the country wasn’t so good. We decided to didn’t care about it. Maybe with our Turkish base it will be fine and that’s what happened. Amazing scenery and very hospitable and kind people! 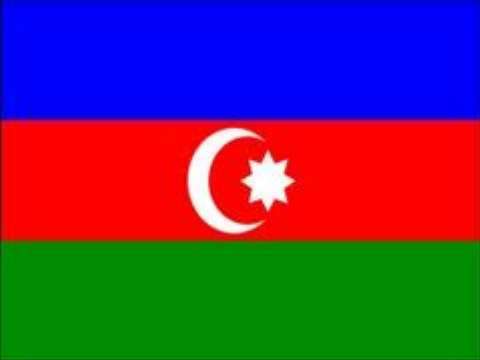 Pour commencer, l’Azerbaijan est un pays majoritairement Musulman. Mais bon quand on demande au gens si ils boivent, ils respondent bien sur que non et une fois venue l’heure du dinner… Aller, un petit verre de vodka… ou deux… Et puis les femmes ne portent pas forcemment le voile donc ici les pratiques liees a la religions sont vraiment moderees. Compare a la Turquie on voit peu de minaret et n’entendons que tres rarement la priere. La culture est tres similaire a celle des Turcs a l’exception fait qu’elle est parsemee d’habitude Russes (Vodka, Lada, dents en or…). Nous y retrouvons cette merveilleuse hospitalite et ce cote chaleureux. Les paysages sont tres varies mais nous n’avons visite que le nord qui est tres montagneux et splendide. Le petrole!! Grace a lui, le pays a depuis quelque annee une economie plutot resplendissante et ca se ressent. To start, let say that the country is mostly muslim. But when we ask the people if they drink, they say no and during the dinner they have a glass of vodka… maybe two… The woman don’t wear the scarf too much so let say that religion here is not that strict! Compare to Turkey we didn’t saw a lot of minaret and we rarely heard the pray. The culture is really similar than the Turkish one but with some Russian habits on it (Vodka, Lada, golden teeth…). We found back there this amazing hospitality and those warm people. The scenery are very different but we only pass trough the north of the country where you can find a lot of wonderfull mountain. Oil!! Thanks to it, the country have a fast growing economy and you can feel it. Le marriage. D’abord le marie vient prendre sa femme, habille d’une robe rouge, au domicile de ses parents. Ensuite, ils sortent de la maison et dehors les gens jouent de la musique et danse. S’en suit le cortege lors duquel les conducteurs roulent encore plus mal que d’habitude pour rejoindre le salon de marriage. La bas c’est la fete. Les mariees s’ont assis sur une espece d’estrade ou tous le monde vas les voir. Plus de 400 personnes avec musiciens et tout… Le presentateur (Eh oui il y en a un!!) Fait des toasts au micro et appelle un a un tous les membres de la famille en commencant par les parents, etc… Les parents prennent le micro, font leur toast et glisse un billet a l’orchestre danse un coup et ainsi de suite des heures durant! Apres la ceremonie, les jeunes tourteraux vont pouvoir pour la premiere fois, rentrer ensemble dans leurs maisons (ou tout le mobilier est paye par les convives) et consommer leur marriage en esperant procreer le premier bebe cette nuit la. Les dents en or sont une ancienne tradition Russe. Avec Mathilde on s’imaginait que c’etait un bon moyen de proteger ses economies. C’est une tradition encore tres respectee dans les villages. Certains ont meme toute les dents! The wedding. First the groom come to take his wife, dressed with a red dress, in her parents home. Then they go out from the home where people are playing music and dancing. The cortege is starting while people are driving worse than usual to reach the wedding salon.There it’s the party. The young couple is sitting in a special place where every come to see them. More than 400 peoples with musicians and everything… The showman (oohh yes there is one!) is doing a lot of toast and call the member of the family one by one. They have to make toast and give some money to the musician and then dance a bit…. And so on… After the ceremony and for the first time, the young couple goes to their home (where all the furniture is gifts from the guest) and during this night try to make the first baby. Golden teeth are a old Russian tradition. With Mathilde we imagined that it’s a good way to protect the economy. This tradition still alive in the villages. Even some people had all of them tooth in gold! On s’y arête pour demande du pain et ces 2 jeunes homes nous invitent pour un the puis pour un repas. Ils sont les premiers a nous parler de leur pays. We stopped there to ask for some bread and the 2 guys invite us for a tea and then for a meal. They are the first to introduce us about them country. On l’appercois au loin le lendemain de notre entrée en Azerbaijan. 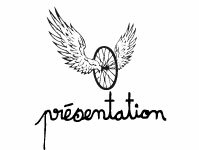 Il est a velo aussi, ainsi nous partageons un petit bout de route ensemble et nous retrouverons a Baku pour faire la traverse de la mer Caspienne ensemble. Lionel rejoint le Kirghizstan, il est un tres bon mecano et nous filera de sacres conseils et coups de pouce. Il deviendra le doyen de notre French team ( avec Cyrielle et Greg)! Son blog :unpetittourdesacocherie. We saw him from far away the day after we entered in Azerbaijan. He is riding a bike as well so we shared the road for a while and meet him again in Baku to cross the Caspian see together. He is reaching Kirghizistan and he is a really good bike mechanician. He helped us a lot. He became the “father” of our French team (with Cyrielle and Greg)! His blog: unpetittourdesacocherie. On trouve campement dans leur plantation de noisetiers, Huseyn vient donc a notre rencontre, nous apporte le the après le repas et nous fait la presentation de sa femme Azada. C’est un jeune ménage tres acceuillant. 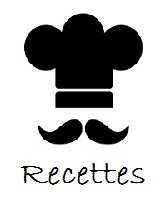 Le lendemain nous sommes invites pour le petit dejeuner, nous partagerons un tres bon moment ensemble et repartirons la peau du ventre bien tendue! We found a nice spot in them hazelnut trees plantation, so Huseyn came to meet us, bringed us tea after dinner and introduced his wife. It’s a young couple very welcoming. The day after they invited us for the breakfast. We had a really good time with them and took back the road full! Perdus dans ce village tres etendu, nous demandons notre route au pere de famille qui nous aiguille et nous invite a boire le the, que les femmes accompagnent automatiquement d’un bon repas copieux. On nous invite meme a dormer sur place mais il est encore trop tot pour penser a dormir! Lost in a small but large village, we asked our way to the father of the family. He told us the way and invited us for the tea. The woman prepared us a nice dinner in the same time. They even invited us to sleep but it was a bit to early to stop. On s’appretait a traverse une riviere lorsqu’un 4x4 nous devance de face, son conducteur, Latif, descend de la voiture pour nous rencontrer. Il est tres sympathique et nous aiguille pour notre route. Latif est le patron de la plus grande exploitation melifere de la region des ex pays sovietiques…plutot interessant pour les adeptes de miel que nous sommes devenus!Il nous indique la route pour rejoindre les ruches qu’il a pose dans le coin a 2 petits kms d’ici, “si ca vous tente d’y passer, j’appelle mon employe qui va vous y recevoir” nous dit il. Bien sur on ne refuse pas. Ilham nous recoit comme convenu au milieu de ces milliers d’abeilles travaillant dur comme fer. Suleyman, son collegue nous rejoint, on partage un the et echangeons beaucoup avec eux. Superbe rencontre! We was almost crossing a river with the bike when a big 4x4 came to us. The driver, Latif, went out of the car to met us. He was really kind to us and helped us to found our way. Latif is a bee keeper and his company is one of the biggest in the ex-soviet country! Interesting for the fan of honey that we became!! He show us the way to his field, where his bees are which is only 2 kms from here. “If you are interesting to go, I call my employee there to welcome you?” Of course we are. Ilham welcomed us in the middle of thousand of bees. They are working like hell! Suleyman, his workmate joined us, we shared a tea and shared a lot with them. Amazing meeting! We stop in that small store tu buy some stuff. When the lady understood that we are travelling by biked she absolutely want to cook our eggs to don’t break them in our bag. We appreciated. While we was waiting, her son invited us for the tea on the backyard and for a dinner (always with the tea). He wanted us to stay for the night but when his wife went to ask the lady, she came on the room a bit angry. What we understood was like she didn’t appreciated that her son make this first move… Or something like this. Too sad cause we felt well there and the sun was already gone. We passed again trough the shop to buy some stuff to the lady in order to calm down the atmosphere. Without big success, say good bye and thanks to everyone and move to find a spot to sleep. Il nous tchatche pendant tout le repas, nous fait une parade avec son beau VTT tout neuf, tient absolument a ce qu’on le prenne en photo dans ses jardins et nous fera une bonne ristourne sur l’addition. He chated with us while we was eating, made a show with his brand new mountainbike. He badly wanted us to take pictures of him in his garden and at the end he friendly made a discount for the meal. Il se demene pour nous trouver un moyen de nous connecter a internet. En appellant un de ses amis qui nous a ramene son ordinateur personnel ainsi que sa cle rooter. Pour nous faire patienter il nous offre le the et en repartant il refuse notre argent! He turned everything up side down in order to provide us internet. Finally a friend of him came with his “data card” a kind of rooter usb key . He offered us the tea while we was waiting and at the end refuse our money. Deniz nous acceuille chez lui a Baku par le biais de couchsurfing.org, il vit avec le petit Deniz, Lena et temporairement Ozan son papa. On se sent vite a l’aise dans ce foyer, Deniz a l’habitude de recevoir du monde et ca se sent. Lena apprecie beaucoup notre presence, comme nous, et nous partageons beaucoup de moments avec elle (cuisine, pedicure pour Mathilde car c’est son metier, ballade en ville, etc…) Elle nous prepare de delicieux repas, nous aiguille sur nos demarches, on la surnomera meme “notre maman azerie”. On partage de bons aperos avec Ozan pendant lesquels on prend plaisir a parler turc a nouveau (Deniz et Ozan sont turques). Deniz host in his flat in Baku via couchsurfing.org, he lived with the “small” Deniz, Lena and temporary his father Ozan. Easy to feel good in this home, Deniz use to host people and you feel it. Lena appreciated a lot our company as we did and so we had really good sharing time together (cooking, pedicure for Mathilde cause it’s het job, walk on the city…) She cooked for us amazing food, helped us for our different issuses, we even called her “our azeri mom”. We shared good drinks with Ozan and loved to spoke Turkish again (Deniz et Ozan ate Turk). Voila les 2 derniers membres de notre French team! On se rencontre a Baku, au RDV hebdomadaire de l’asso Nature Friends. Ils sont bien a l’aise sur leurs velos couches depuis 3 mois a la conquete de l’Asie. Ils ont déjà pas mal roule avec Lionel et c’est ainsi que l’equipe se forme. Un joyeux petit couple dont vous pouvez suivre les aventures sur: terrecyclable. Here we are, the two other members of our “French Team”! We met them in Baku, during the weekly “Nature Friends” meeting. They are really well lay down on them horizontal bike for 3 months now to reach Asia. They already ride a while with Lionel and that’s how the team appeared. A lovely couple that you can follow the adventure in this link: terrecyclable. Les bouilloires traditionnelles sont des especes de gros trophees avec un tube au milieu ou l’on met du charbon incandescent. L’eau qui est stockee autour de ce tube chauffe donc jusqu’a bouillir puis on la recupere grace au petit robinet sur la devanture. The traditional boiler is a kind of big trophy with a tube on the middle where we put some burning coal on it. The water around his getting warm until it boil and then we get it from a tap on the front. Ils adorent klaxonnes a tout vas! Vraiment tout le temps! Pas trop de cycliste en general car il considere ca comme un jouet pour les enfants… Et le petrole est tellement peu cher! Grace a “Nature Friends” nous avons donc decouvert des magasins de velos bien fournis avec un vendeur bien sympathique (qui fait parti de l’asso). Il y a un petit monsieur cache dans un coin qui est un professional de la mecanique velo. Il a des pieces et des outils qui sont dur a trouver et peut etre d’une bonne aide. Encore faut-il le trouver. Mais voila le lien d’ou il se situe. Comme il y a un “Tour de France”,il y a un “tour d’Azerbaijan”… et ecrit en Francais! Bon ca ne dure que quatre jours. People drive like mad, they don’t have any road education. They love using the horn for everything. Generally road are not so nice. But in the northern road following the Caucasus, at the last part the road is quite new. There is not a lot of cyclist in Azerbaijan. They consider the bike as a toy and oil is so cheap so they don’t get the point! Thanks to Nature Friend, we discovered some good bike shop well furnished with kind saler (Members of the association). There is a man hiding somewhere who is a professional bike mechanician.He had some rare spare parts and tools and may be a good help. Just have to find him. Here is the link to find him. As there is a “Tour de France” there is here a “Tour d’Azerbaijan”… writing in French. So funny! But it’s only for a week. Les petits village entre la route prinicipale passant au milieu et celle du nord sont un excellent endroit ou se perdre et ou rencontrer les gens. 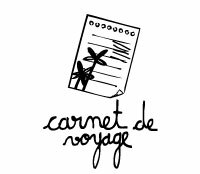 Nous y avons fait en un jour seulement un nombre incalculable de rencontres. La nature est belle, c’est calme et la vie a l’air d’y etre paisible. Avant d’arriver a Baku, ca vaut le coup d’y flaner car les gens y sont authentique et largement moins europeanise que dans la capitale. A ce qu’il parait, Saki (prononce cheki) a un haut attrait historique mais nous n’y sommes pas reste. Samaxi (prononce Chamareu)est l’endroit ou vous pouvez voir tout ces toits et autre portes d’entrees tres travaille. C’est tres originale et tres beau. Bien sur le Caucasse au nord doit valoir le coup pour de magnifiques trek. Les sommets culminent a plus de 3000 metres! Baku, bien que nouvellement riche et donc tres demonstrative, a certain attrait. La vieille ville (protégé par l’Unesco) est vraiment charmante et semble etre perdu au milieu de ces tours modernes. La maison du gouvernement est impressionante aussi. Les nouveaux buildings sont vraiments… comment dire… flamboyant! Tout a fait dans le style de Dubai! Le contraste et amusant. Si vous prenez le feniculaire gratuit pour monter pres des 3 tours (en forme de flame) vous aurez une belle vue sur la ville. The small villages between the main road in the center and the one on the north are an amazing spot to be lost and meet people. We did, in one day only, a lot of meeting. Nature is beautiful, it’s quiet and the way of life seems to be cool! Before to reach Baku it worth it to just hang around there, people are more authentic and less europeanised than in the capital. Saki seems to be historically interesting but we didn’t stop there. Samaxi is the place where you can see those roofs and doors in iron. Original and beautiful! Of course, Caucasus mountain in the north seems to be an amazing place for mountaineering.There is some 3000 meters summit! Baku, it’s a new rich city and so very kind of boasting! The old part of the city is really charming (protected by Unesco) and seems to be lost in the middle of those futurist building! The house of the gouvernement is really imprestive as well. The new building are… how to say…. Very new!Dubai style! The contrast is funny. If you take the free funicular to reach the three tower (Flame shape) you will get a beautiful view on the city.